These covers do help keep the furnace duct work clean during the summer, which is a big help, and they stay in place - a definite plus. This covers a heat vent built into the floor that we prefer not to use. The cover is cut to size, placed on top of the closed vent, and an area rug covers that nicely. Over time, because of repeated foot traffic, the cover has deteriorated slightly, thus the reason to replace it. It's a very inexpensive fix! Cover my air vents in rooms I don't use. Ducts in my small bathrooms leak air even when they are closed so the covers help keep the rooms comfortable. My ducts are small so I can cut them to fit. I've been looking for these cover for a long time. I have weird sized heat vents and couldn't find magnetic vent covers to fit them. I saw these and the size they were so I ordered 2 sets. I cut them to fit my vents and they were perfect! They are ceiling vents and these hold very well! Some of my heater/cooling vents are difficult to close completely. Some are located on a high ceiling that needed a ladder to close. Used one to absolutely close the vent directly under an antique cabinet. This was very useful to control the air conditioning in 2 rooms where the vents were blowing too much and making the rooms freezing cold. I put these on all my vents that don't have an open/close lever and even in rooms rarely used, and they are terrific! It really helps funnel the heat or air to the rooms where they are needed the most! I love them and HIGHLY recommend them! PERFECT!! These covers are great items. If you want to block off some vents, these are the things to use. I like that they are white, so they look clean and they fit right in with almost any decor. I was able to cut the covers very easly and they hold just fine. They work nicely to block warm air in house from escaping into air conditioning vents during cold weather but the weight of the product sometimes causes them to lose contact around edges. Our home is very old so the vent covers don't fit as well as newer homes but they work. I was able to take one of them and cut it to block an opening where there used to be a lever to close the vent. It was large enough of an opening to allow a bat to fly into the house now it is blocked with the piece that we cut out from the vent covers. On the photo it appears small and our vent is small and I hate to cut it to size. I left it big but it still works. Air vents don't close completely. This product totally blocks air flow or can be cut to partially block air flow or send it in a different direction. These magnetic covers work great. My registers are in the floor, and I have one which is located in a bad place in the kitchen. It's right in front of my sink, where I stand while doing dishes. I needed something other than a rug to cover the vent, because the air would move the rug. These are strong enough to stay in place very well. 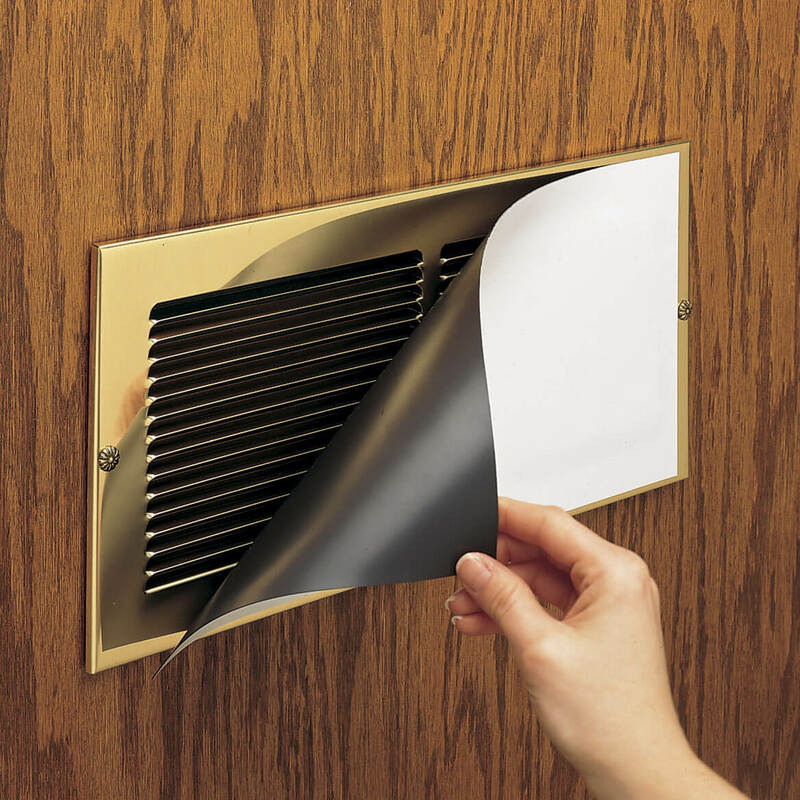 This is a great product to cover a metal vent when the air is unwanted in any given room. It is well made and of a good size. We have a guest room that's used only for that. When it's not being used I shut down the air vents to save on the electric bill. This summer, even with them closed, the room was still being cooled down by what was coming out around the closed vents. I put the magnetic covers on and they shut the vents off completely, strong seal. You walked into the room several days later and you can feel no cooling at all, down right hot in there now. Only time will tell just how long they last. The magnetic hold is weak to start. If they hold they're a good deal to conserve energy and save money. Very few companies still carry the magnet vent covers. They are the perfect way to block cold air going into a crawl space. This was the BEST purchase I have made [...] I have recommended them to many neighbors and am sure they will be purchasing some before next years freeze! Maybe even sooner since this frigid winter seems to be non-ending. Great for floor vent coverings when they are not needed, or to increase air flow in other floor vents better needed for warmth or cooling. Also great to cover white metal appliances that have scratches on them. I bought these for my mother, who has two registers in her room, and cant take the constant temp. changes. She can simply stick these on and control the temp in her own room. She loves them! With needing to keep our home warmer and to save money, these are exactly what I was looking for. They were easy to use. No complaints. A good product. Have used to cover celing return registers and floor registers. The cover works very well. It is not for all covers. Since they are magnet, you have to make sure your covers are metal. Won't stick on Aluminium covers...we had to place the cover on the inside of the vent. Using on the vents in my basement. I don't like heating all the rooms in my basement in the winter, so with these I can easily decide which vents I want to close off. I painted one of them to match the wall color and you can't even tell it is there!! It works in keeping air out of a room not needed but it is not heavy enough or not enough magnetic pull to keep it in place. I thought this was a good idea. I live in a 2-story twnhse in South Florida and the 2nd floor does not seem to cool down in the summers. I wanted to use these to cover my vents downstairs to get more needed air conditioning upstairs. Unfortunately, I discovered my vents were not actually metal and the magnets did not hold to them. They are on their way back. :( Make sure to check yours first! Bought this product to control the cold air from blowing through the vents in my basement making it freezing cold. Thought these would fit nicely over them so the air wouldn't blow in but they don't even stick on the vent. Am I doing something wrong? Many register covers today are made of aluminum or plastic. The magnet won't hold to these materials. We tried to buy a metal one at [@]t. They only had plastic register covers. Very disappointed. We couldn't use these magnetic covers. Items will not adhere to the vent covers????? Bough this item for the air-conditioning vents in the ceiling. The magnetic was too weak to hold itself on even without air coming out. I had to return paying the postage that costed me more than half the price I paid. I've tried many types of magnets and they all stick to my vents. These do not. The magnets are apparently too weak for this purpose. The magnet is so weak it does not even pick up a paper clip, let alone hang upside down from the ceiling registers. The only way they will stay up is if you duct tape them up. These are a complete waste of money. These magnet covers are a complete waste of money. They are too thin, hardly stick to the vents, and then, even with the vent closed they come off when the air comes on. Do NOT waste your money on these. I had these years ago and couldn't find them. They were great for directing air into other rooms. Have vent by chair. Blows on me. I have a room that isn't being used and want to block the a/c when we don't need to access the room to save on a/c costs. I needed to replace the ones I bought 20+ years ago. The ones I had lasted but just got too dirty with age. Thought this might work better than duck tape. i dont use all rooms in my house. i cant see cooling all of them. The heat in my office is unbearable. With these magnets [which I have had before], I can send the heat on to the next office. These WORK! Stop heating rooms I'm not using. These were recommended by heating technician to reduce draft and keep heating bills down, and I always trust Miles Kimball for quality and value. duh... to reduce air leakage thru a/c vents. To see if it works. Sometimes the air is too cold for me. My sister has one and we would like to block heat and air in some of our extra rooms. To cover the vents that are no longer in use. Often replace these to vent into other areas of the home. Need a solution to a small vent & Miles Kimball has always provided good products! I have a vent over my AC and it pulls all the cool air from this solves the problem. Multiple vents in home needing temporary blocking. My daughter has a 1 year old that likes to put his face to the vent each time it comes on. So hopefully these will stop him. To cover vents for the winter. I need to stop airflow in my closets. I live in a mobile home with floor vents. In the summer, the air beneath is warm; in the winter, it's cold, although it's where the heat comes into my rooms. But during hot weather, the hot air isn't welcome, and in winter, all rooms don't always need the warmth. I'm hoping these gizmos will allow me to control this better, and have a tighter rein on my utility bills. To block heat in one room. Needed to cover vents to prevent air conditioning from going into basement and not make it to second floor. Worked very well. To keep from losing hot air in unused rooms. Dah!!! to cover vents in unused rooms. I picked these because they are the right kind, size, price, and the reviews were good. I hope they work! To save a sizable amount on my winter heating bill. I can now turn off the electric heat and use space heaters in the main rooms and cover up the floor vents where the fan puts out cold air, even when the heat is off. This item is extremely hard to find. So glad you had it. Folks, buy them while you can. It is great investment. I have a vented basement that is not in use and want to save on my electric bill. a/c is colder downstairs,and this will send more air/cond upstairs.Hopefully..Will let you know.Thank you. Need to block cold air blowing to the back of my neck. If a vent does not close or stay closed this is wonderful. Do they stick to aluminum? BEST ANSWER: Thank you for your question. No it will only work with a metal surface. We hope this information will be of help to you. In our experience, they do not stick to aluminum or stainless steel. Our vents lie flat on the floor and the covers stay. No. Has to be applied to a metal/steel surface. Is there only one cover in the package or two? BEST ANSWER: Thank you for your question. This is a set of three. We hope this information will be of help to you.